This is a heavyweight aluminum easel that holds canvases, pads, and boards from 6" (15 cm) high up to 48" (122 cm) high and up to 1¼" (3 cm) thick, making it ideal for tabletop, studio, display or field use. The finely crafted design features a rectangular profile frame for extra strength, one shelf and two sets of brackets to fit a wide range of canvas and pad sizes. The reinforced 17½" (44 cm) canvas shelf includes a panel groove to hold all kinds of work securely. 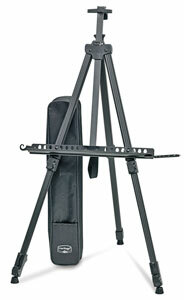 The easel is 69" (175 cm) high when fully extended, and it closes up to a mere 25" (64 cm). It holds up to 25 lb (11 kg), yet weighs only 2½ lb (1 kg)! A nylon carry case is included. ® Alvin is a registered trademark.™ Heritage is a trademark.